There is this movie theatre that my sister and I like to frequent, and I’ll be honest – it’s because they bring food to you. And the one thing my sister always gets without fail is the potato skins. This appetizer (or meal) make a perfect game day treat to eat while watching the big game. They are filling and have such a great flavor. You can add a variety of toppings to them but I like the plain bacon and cheese combo. I made these a couple of ways – one split down the middle. The other cut in thirds with the split closer to the edge so you don’t have a lot of empty space to fill with gooey cheese. They were both good so it is just your preference on how much skin you want. You could also cut these in half again to make smaller portions. Wash and scrub the potatoes real good. Dry the potatoes. Drizzle olive oil over the potatoes and season with salt. Prick the potatoes a few times with a fork. Place the potatoes on a cookie sheet and bake for about one hour. Let the potatoes cool enough so you can handle them with your hands. Cut the potatoes lengthwise either down the middle or in thirds. 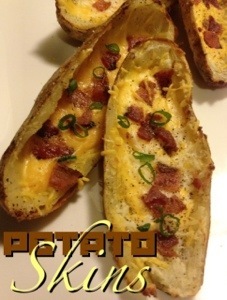 Using a cookie dough scoop or a spoon, scrape the filling out leaving about 1/4 inch potato on the skin. Turn oven on to the broiler position. Liberally brush melted butter on the inside and outside of the potato skins. Season the inside with salt and pepper. Place on a broiler safe pan and place under the broiler for about 3-5 minutes on each side. Take the potatoes out and fill with cheeses and bacon. Place under the broiler for a couple of minutes until cheese is melted. Season with salt and pepper and top with green onions and sour cream if you like. Personally I’m not a fan but I am leaning to be.